The Phil Dawson era came to a predictable end on Tuesday as the veteran kicker reportedly signed a contract with the San Francisco 49ers. The signing ends Dawson’s 14-year career with the Cleveland Browns. He made his final season in Brown and Orange his best as he earned his first Pro Bowl appearance after making 93.5 percent of his field-goal attempts – the second-best percentage in the NFL. Dawson replaces David Akers in San Francisco, who made just 69 percent of his field-goal attempts last year. Akers joined the 49ers after being released by Philadelphia – when Joe Banner was working for the Eagles. While the move has been expected almost since the start of the 2012 season it is still disappointing. Dawson has gotten better as he has gotten older and he’s shown no signs of having his game slip. He is 27-of-29 on attempts of more than 40 yards over the past two seasons, and was a ridiculous 14-of-15 on kicks of 50 yards or more in 2012. He also had a chance at breaking Lou Groza’s all-time franchise scoring mark if he had returned for another season. Dawson’s biggest strength was knowing how to kick in the often tricky conditions of Cleveland’s winters. (When the weather is at its worst, we were always reminded of a line from the movie First Blood: What others call hell, he calls home). Even though we understand why the Browns are moving on – you always want to try to move on from a player a year early rather than a year late – we’re fairly certain this is going to come back and bite the Browns at some point this fall. Whoever replaces Dawson is sure to miss a kick at a crucial spot and, while it won’t cost the Browns a playoff spot in 2013, that won’t be any consolation to the fans. 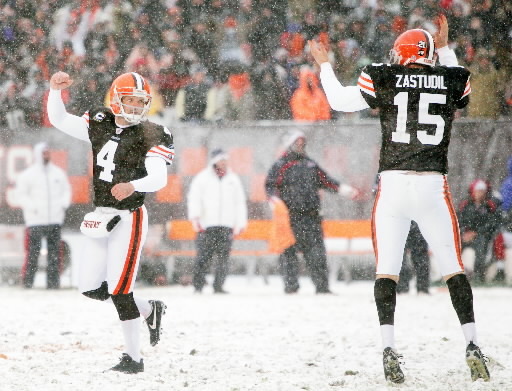 The Browns deciding to move on from Dawson reminds us of the last time the team decided to replace a popular and successful kicker. After spending eight years with the Browns – including four playoff appearances in the late 1980s – the Browns decided after the 1989 season that they didn’t need Matt Bahr anymore. However, the team did realize it needed a kicker for the 1990 season and team officials decided that the man for the job was Jerry Kauric, who had kicked for the Edmonton Eskimos of the Canadian Football League. Kauric lasted one year in Cleveland, making just 70 percent of his field goals, before the team remembered that successfully kicking field goals is kind of important. The Browns turned the job over to Matt Stover in 1991 and Stover went on to have a 19-year career in the NFL. As for Bahr, he signed with the New York Giants, where he played for three years. He earned a Super Bowl ring in 1990 as the Giants beat Buffalo. In the Super Bowl Bahr kicked two field goals, including the kick that ended up being the deciding points. Could Dawson be following the same path in San Francisco as Bahr did in New York? Quite possibly. Could there be another Jerry Kauric on the horizon for the Browns? That’s also possible. While Dawson moves on to the next stage of his career, he’ll always be a Brown. Even though the team around him was rarely any good, there are still plenty of memorable moments, from his field goal off the cross bar to beat Baltimore in overtime to his game against Buffalo in a blizzard at the former Cleveland Browns Stadium. There’s also little doubt that one day we will see Dawson inducted into the team’s Ring of Honor. Although with the way Dawson is going, that day could still be quite a few years off.